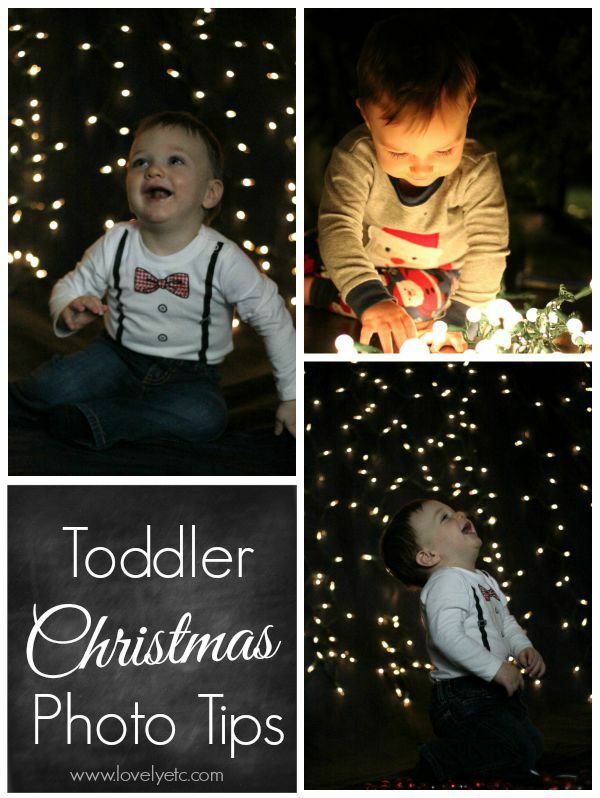 Tips for taking Christmas photos of your toddler - Lovely Etc. I knew months ago that this was going to be our first year sending out photo cards. I definitely didn’t want to pass up the chance to show off pictures of Griffin, the most beautiful boy in the world. (As his mom, I’m pretty sure showing him off is one of my duties. As is knowing he is the most beautiful boy in the world). Well, before you can have photo cards, you must have photos. 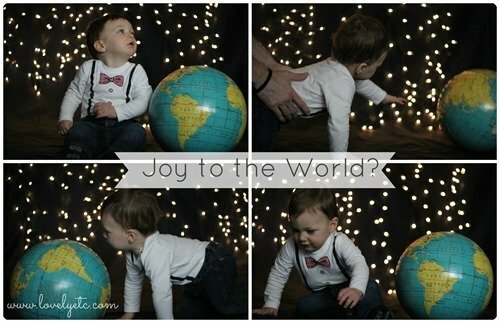 And even though we have hundreds of precious photos of the little guy, I wanted to try my hand at taking some cute Christmas photos. These are my top tips for taking fabulous Christmas pictures of your own toddler. Give them something to play with. The first set up took almost no preparation. 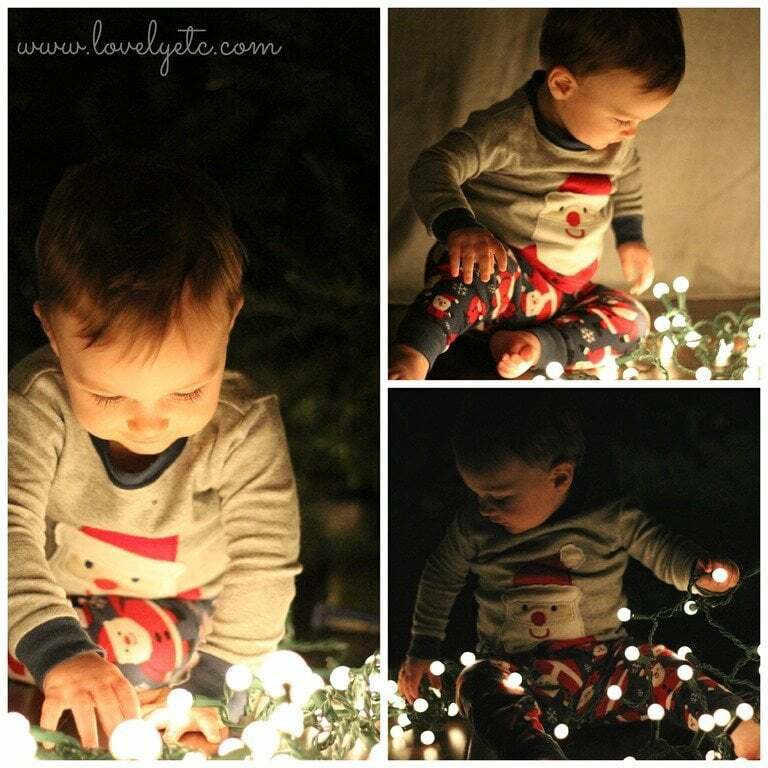 At bedtime one night, I dressed Griffin in a pair of Christmas pajamas, turned off all of the lights, and plugged in a string of Christmas lights on the floor. 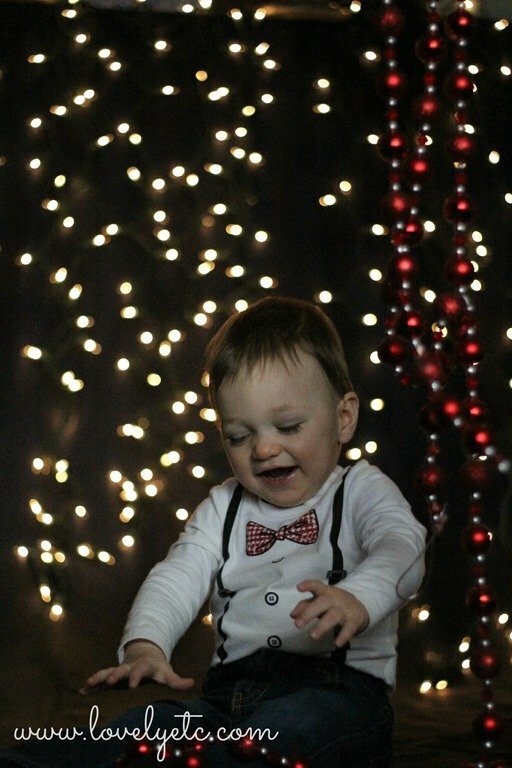 (Disclaimer: Griffin happens to be a most unusual baby who doesn’t put anything in his mouth so I didn’t have to worry about him chewing on the lights and I was right next to him in case anything else dangerous happened). The lights really captured his attention and made for some cute pictures. The second photo shoot was a bit more elaborate. 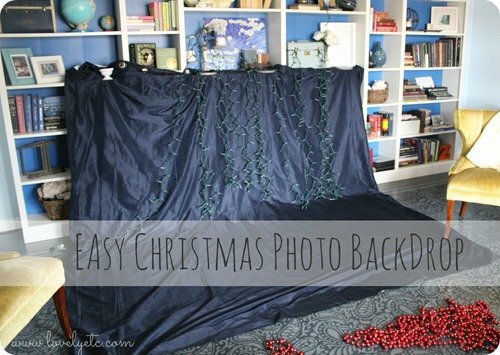 I used a huge navy silk curtain panel that I got for $3 at a warehouse sale. To hang it I simply anchored it to the bookshelves with weights, letting it drape onto the floor. 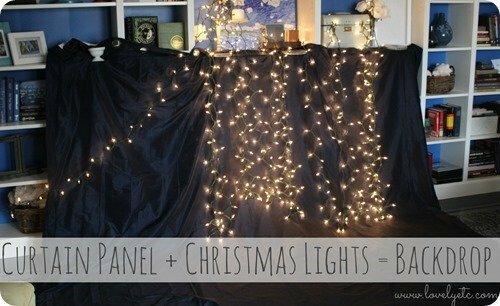 Then I added Christmas lights to the curtain backdrop. Since I was doing this in front of shelves, I simply draped the lights from various objects on the shelves, letting them hang down. 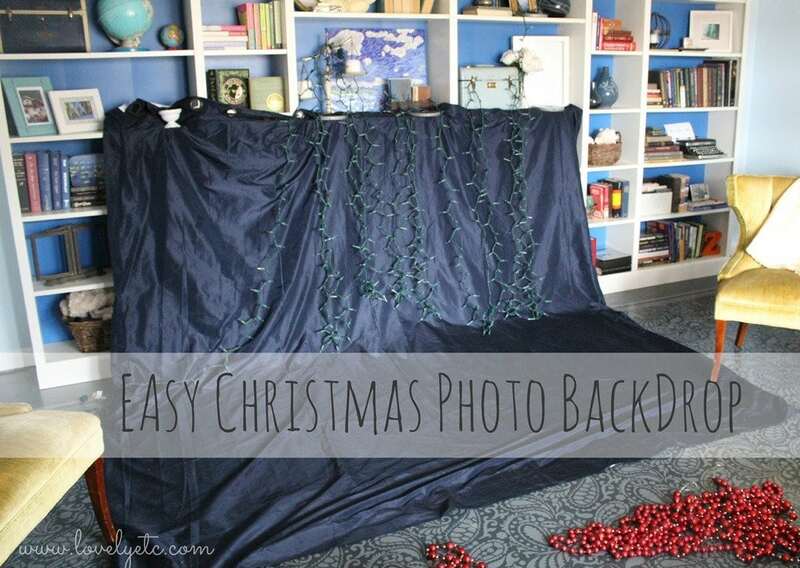 If you are creating your backdrop against a wall instead of shelves, taping the lights to the curtains with dark duct tape should work well too. My original idea was to take pictures of Griffin with a vintage globe to create a Joy to the World Christmas card. Well….as you know, toddlers are quite unpredictable so that didn’t quite pan out. The pictures were mostly of Griffin either chasing the globe around the room or crawling away from it. When the globe wasn’t working out, we had to go with plan B. I had also grabbed some Christmas garland that was waiting to be hung on the tree as a back up plan. This is where my assistant (my husband) came in. Griffin had no interest in the garland unless hubby waved it around in the air. That was what finally brought out the smiles. Choose photos that show some personality. Let’s face it – toddlers are not great at sitting still and smiling pretty. They are always on the move, always exploring. Instead of fighting it, embrace it. Choose a photo for your Christmas card that shows some personality and tells a bit of a story. For our own Christmas card, we ended up going with three different photos. Together they tell a story of the joy and wonder Griffin is experiencing this Christmas. 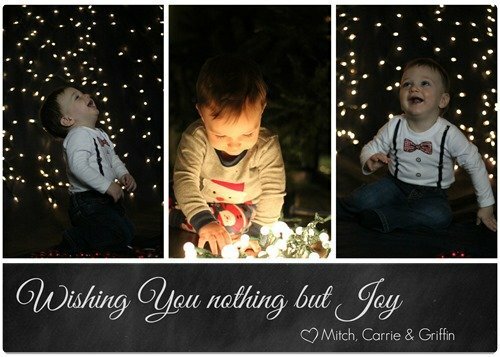 I put together our Christmas cards using the free site picmonkey. (affiliate link) I used basically the same process as the invitations I showed you how to make here. Are you sending Christmas cards this year? How do you choose which photos to include? And anyone have Christmas photo taking tips to add? SO sweet! I love your tips. And, the card turned out great! These are great ideas. I’m going to try to the string of lights just plugged in. Fingers crossed my son doesn’t put them in his mouth. Thanks Tisha! Here is hoping you get some great shots – and he doesn’t eat the lights! Good question! I had to go back and look at them to see because it has been a couple of years since I took these. (It is time to take some for this year!) I have a Canon t3i and I used a 50 mm 1.8 prime lens. It looks like I shot the ones with the curtain/lights in the background set up at f/1.8 1/2000 second and ISO-6400. (I’m sure it would be much better to use a lower ISO but is it super dark inside my house, so I have to do what works and I needed a fast speed for this guy.) The ones where he is playing with the lights are f/2 1/320 second and ISO 6400. I hope that helps – I’m not an expert photographer by any means, I just love to take photos of my family!